We are a student-run newsroom based on Quinnipiac's campus. We cover news affecting the Quinnipiac community and its surrounding areas. Savannah is a 4+1 Journalism major pursuing an accelerated degree in Public Relations. She currently works as an intern for iHeartMedia and is a red-carpet correspondent for both independent and major motion picture studios, including Lionsgate. She has interviewed celebrities such as the Soprano’s Vincent Pastore and has traveled to more than 25 different countries. She is also a first generation American, currently in the process of obtaining her Italian citizenship. Shayla is etching her way through an accelerated track at Quinnipiac University, where she is pursuing a double major in journalism and English with a minor in international business. She’s been chasing stories since before she could multiply and loves discovering a new way to inspire positive change in society. She has interned with the Futuro Media company pitching in with the In the Thick podcast and digital stories for Latino USA and Latino Rebels. In her leisure time, she seeks out new strangers to meet in the world and loses herself in the Romantics’ writing. Kirby is the Chairman of the Quinnipiac Bobcats Sports Network and previously interned with NASCAR’s Integrated Marketing Communications team. He has a passion for storytelling and defining what creativity and growth mean to companies, their brand, and their stakeholders. Kirby spends a majority of his time reliving great Boston sports moments on YouTube and binge-watching old episodes of Kitchen Nightmares. Michaela is a Journalism and Interactive and Graphic Design student with a passion for telling stories in unique ways. Last fall she spent a semester interning with WTNH, working on the assignment desk and learning about web production. She enjoys working with communities and would like to start her own grassroots program. Michaela enjoys science, travel and nature. Her dream job is to work for National Geographic. Most times you can find her outside throwing for the Track and Field team and she will hold a Captain position upon the outdoor season. From a small town in Massachusetts, this gal is a goal chaser and jet-setter. Rachael found her affinity for travel after studying abroad in Australia where she combined her love for storytelling and photography to illustrate her adventures. As a previous marketing intern for two small businesses, she hopes to continue her journey as a photojournalist in Australia after graduation. In the meantime, she volunteers her time as the Public Relations Officer for the Student Veterans Organization and is the president of QU Spirit Group. Rachael is a dancing soul with a creative mind and finds joy putting pen to paper. Caitlin Fish is a natural born critical thinker. Her interests range from writing, video and sound editing, graphic design and photography. She’s gained writing experience interning for The Rockland County Times, a local New York newspaper. After spending three months as a graphic design intern for Visual Artist Group and Coldwell Banker in Los Angeles, she hopes to start her career on the west coast. Logan is a member of the accelerated dual-degree (3+1) program at Quinnipiac University while also serving as the web director of The Quinnipiac Chronicle. He has previously interned with the Record-Journal newspaper (Meriden, Connecticut) and NFL Media (Los Angeles) and is currently interning with NBC Sports Group (Stamford, Connecticut). Logan is watching sports and scrolling Twitter at all hours of the day. Kristina hopes to one day write for an arts or lifestyle magazine. She previously wrote for The Quinnipiac Chronicle’s Arts and Life section and interned for the London-based PR company TDC, where she contributed to its online magazine SODA. When she’s not writing, she can be found curled up with either a book or her golden retriever in her lap. Sometimes both. Marissa has worked with multiple Q30 shows during her time at Quinnipiac. She is also a member of the Zeta Zeta chapter of Phi Sigma Sigma. She studied abroad in Barcelona during spring semester of her junior year and fell in love with the city and hopes to move back one day. She has interned for South Coast Central News at Marshfield Community Television. Some of her favorite things are animals, fashion, makeup, travel and her five pets. Emma is a journalism and graphic and interactive design double major. She grew up in a small town in Maine, and yes she’s seen a moose. She’s seen two, and both were in her backyard. 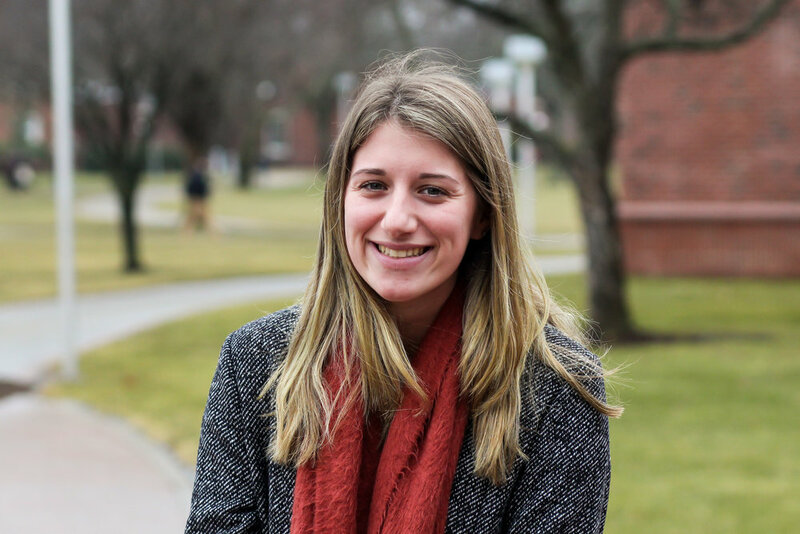 Emma is currently a graphic design intern at Inspira Marketing in Norwalk, Connecticut, where she creates visual content for social media and the company’s blog. On campus, she is the vice president of the Quinnipiac Bobcats Sports Network. Ross is a 4 + 1 Journalism major, with a minor in Sports Studies and Spanish. He has a passion for sports and is pursuing a career as a sports reporter or analyst. He enjoys writing feature stories about his favorite athletes. Last summer, he studied abroad in Salamanca, Spain, immersing himself in the Spanish culture. When he is not writing, Ross plays on the New Blue Rugby club team. This summer, he will be interning with Sports Video Group (Manhattan, New York) as a content editor. Sam is in the 3+1 Communications program at Quinnipiac, minoring in English and pursuing a career at an art and fashion magazine. She spent a semester studying abroad in Dublin, Ireland where she became versed in the art of pub crawls and eating various potato items. Los Angeles was next in her travels as she got the opportunity to intern for Flaunt Magazine, an eccentric media company in the heart of Hollywood. Here she fell in love with avocados and sunny days that never dipped below 75 degrees. Sam’s prior experience includes Arts and Life Editor for the Quinnipiac Chronicle and Arts and Entertainment intern at The Day newspaper in New London. Jeremy is currently a copy editor for the Quinnipiac Chronicle, and has written for the Chronicle since his freshman year. When he is not reporting and editing, he loves traveling, watching sports, listening to music and reading. He has previously interned at the Northern Westchester Examiner in his native Westchester County, New York and at Information Services Group in Stamford, Connecticut. Hannah’s dream job is to be a photojournalist for National Geographic. When she is not hanging out with friends, reading romance novels or investigating local news stories, Hannah is busy interning at Fox 61 in the news department, volunteering at the Ronald McDonald House in New Haven with her sorority sisters, or convincing as many people as possible that climate change IS real. When she isn’t writing, Aliza enjoys spending time on her other passions, which include cooking, fitness, and traveling. Aliza also spent this past summer living and working in Washington, D.C. as a communications intern at a nonprofit. Our professor says you only become a real journalist once you’re fired from your first job. Well, Jess was just fired from the school paper, so we’re halfway there! Jess is a third-year student in an accelerated program at the Q. Although she endures Connecticut weather eight out of the 12 months of the year, she escaped to the West Coast briefly where she interned at two boutique production companies. When she’s not immersed in work, applying for job opportunities or mentally preparing for graduation, you can find her writing news or reading in a quaint coffee shop.